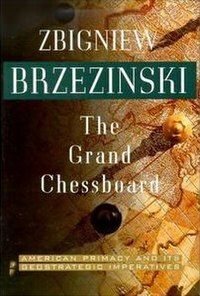 The Grand Chessboard: American Primacy and Its Geostrategic Imperatives (1997) is one of the major works of Zbigniew Brzezinski. Brzezinski graduated with a PhD from Harvard University in 1953 and became Professor of American Foreign Policy at Johns Hopkins University before becoming the United States National Security Advisor during 1977–81 under the administration of President Jimmy Carter. Regarding the landmass of Eurasia as the center of global power, Brzezinski sets out to formulate a Eurasian geostrategy for the United States. In particular, he writes, it is imperative that no Eurasian challenger should emerge capable of dominating Eurasia and thus also of challenging America's global pre-eminence. Much of his analysis is concerned with geostrategy in Central Asia, focusing on the exercise of power on the Eurasian landmass in a post-Soviet environment. In his chapter dedicated to what he refers to as the "Eurasian Balkans", Brzezinski makes use of Halford J. Mackinder's Heartland Theory. The book was critically reviewed by The New York Times, Kirkus Reviews, Foreign Affairs, and other publications. This page was last edited on 26 March 2019, at 15:43 (UTC).